I think the truest sense of the coaching Team Canada is receiving is evident in their special teams. Nowhere else do the coaches have as much ability to impact the game, after choosing the roster of course. Special teams are among the only situations in a hockey game with stagnant positional play. Team Canada’s coaching staff will know, after the first game of the tournament, where ever player on opposing teams will line up on the powerplay. From there it will be up to Glass & Out guest and Hockey Canada Video Coach Tyler Dietrich to create an efficient video presentation. I’m particularly interested in team Canada’s penalty kill. Will they go with an ultra aggressive forecheck and try to disrupt their opponents before they can set up? 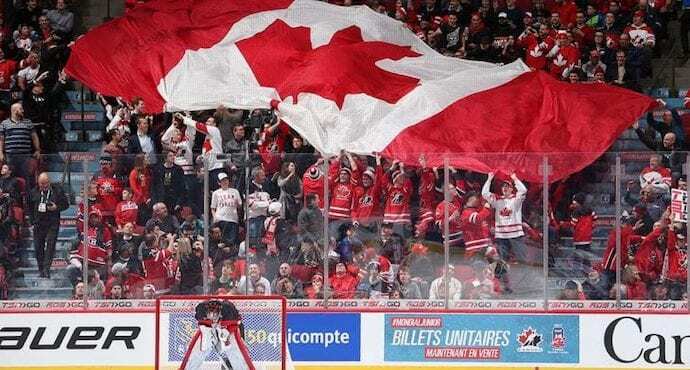 If you were coaching Team Canada, a team of players who have never played with each other before, and you were playing against a national program with experience and comfort on their power play, would you pressure or contain? Would you bank on nerves and play physical, or would you respect the skill of your opponent and make sure you play them smart. When it comes to the powerplay, there’s nothing like watching the creativity of the game’s finest young hockey players. I’m hoping they’ve come up with something unique that capitalizes on the embarrassment of riches they have at their disposal. Aggressive special teams, watch for it! And that’s a wrap for our six part World Junior Championship series. We hope you enjoyed and that we’ve given you a few fun tidbits to think about when you watch the tournament over the holidays. From everyone here at The Coaches Site, enjoy yourself safely over the break, Merry Christmas, and all the best to you and your team in the new year!